Recently I noticed a lot of curiosity in the distilled spirits world about the people who do the hard work in the field. This is awesome! These folks are rarely visible to those pouring or imbibing spirits in bars, so any opportunity we have to tell their story is one that we will take. 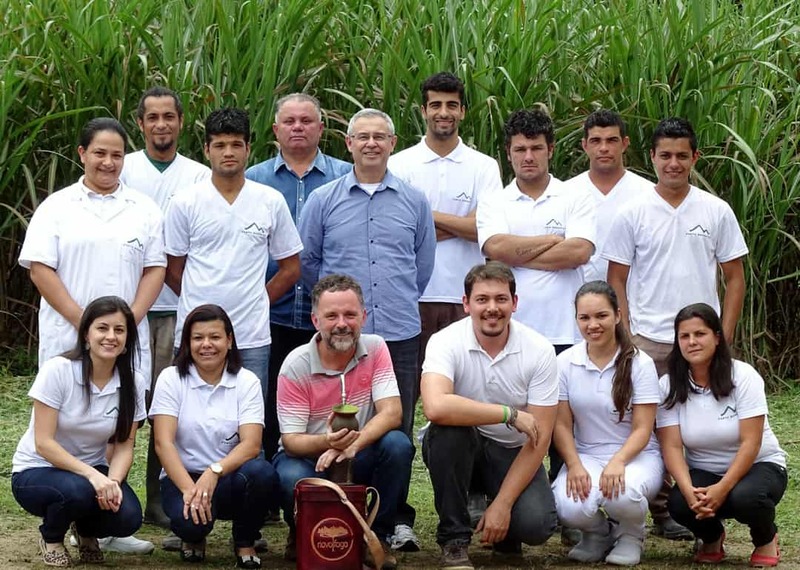 So I’d like to tell you a few things about Novo Fogo’s sugarcane field team. They are a cool bunch of people and they are Ozeias, Sandro, Othero, Italo, Celso, and Emerson. Ozeias is the team leader and has been with us since the distillery opened its doors in 2004. Sandro is a veteran of 7 years and his sister Luciane also works at the distillery, as the Production Manager. Othero joined the team in 2013 and we have not yet seen him without a smile on his face. Italo, Celso, and Emerson are newbies but strong additions through their work ethic and attitude. They joined our team in the last few months, after Novo Fogo took ownership of the distillery in June. With their help, in the last few months we have been planting cane on additional stretches of our property, getting ready for a capacity increase. Italo’s mother Marinês also works with us, on the bottling line. In Morretes, the line between family, friends, and work is very subtle, and we like it that way. The distillery team, from left to right. Back row: Marinês Tomé, Othero Manuel, Celso Cordeiro, Francisco Lima, Fulgencio Torres Viruel, Italo Abreu, Emerson Oliveira, Ozeias Cordeiro, Sandro Rosa. Front row: Franciele Silva, Heverlim Miranda, Agenor Maccari, Jr., Luigi Moroni, Gisele Oliveira, Luciane Fernanda. I call them “the field team” because their jobs go beyond cutting cane, which only happens for a few short months every year. 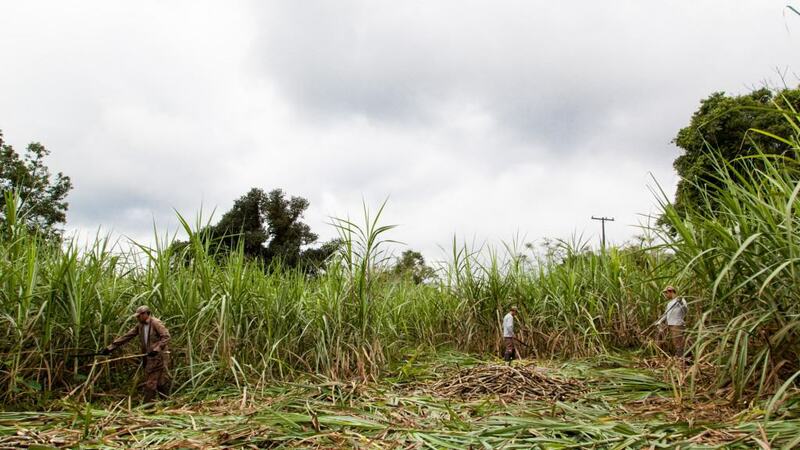 When you operate a USDA organic certified, zero-waste distillery, the sugarcane uses nothing but sunshine, rain, and love to grow tall and healthy. For example, we don’t use herbicides to kill weeds, we use our brains and hands: we plant the cane in certain patterns that reduce the sunlight to the weeds, inhibiting their ability to grow; and, when that’s not sufficient, we pull the weeds by hand. These guys are working in the field year-round, plowing, seeding, trimming, weeding, and so on. It’s also hot — we’re about as far away from the equator as Miami. To top that, the rainforest canopy reduces evaporation, making the area super humid too. That is why the field team takes several mandatory indoor breaks each day (the company pays for the snacks and coffee) and they do not work between noon and 3PM during the summer months of January, February, and March. We pay them by the hour and they are not allowed to work more than 44 hours per week in the field. If they want overtime, they come inside the distillery building to fill, cork, label, and seal bottles and put them in cases. In fact, if you look at the little labels on our bottles, you will see their signatures. I asked them to do that years ago, so that their initials could travel to the coolest bars in North America. If you see the initials OC, SR, OM, IA, CC, and EO, you’ll know that they signed your bottle; please take a picture and send it to us. Something else I love about them: they always strive for personal growth. We’ve offered the entire team English classes from our teacher friend Mirian, and every single one signed up for them. (This mirrors the Portuguese classes that our US contingent takes… most of the time.) The point is that we are one family, so we’re seeking that everyone on the team be able to converse with everyone else on the team, regardless of the continent, rather than just through a few bi-lingual speakers. Not a bad view from the office! The region's tallest peak, Pico do Marumbi, towers above our alambique. It's hard to catch Othero without a smile! Ozeias, Italo, and Gisele during English class taught by our friend Mirian. Sandro cutting cane during the safra (harvest). Our cane fields are just 10 feet from the edge of the rainforest. English class in session at the alambique. Othero cutting cane during the safra (harvest). Italo works in the distillery filling mini cachaça bottles. When rocks are in the way, remove the rocks! The team prepares a field for planting cane. Sandro caps mini cachaça bottles. We have a “duplex” on the property and Sandro lives in one of them. (Our marketing dude Luigi and his lady Bianca live in the other.) It’s not luxurious but it’s free and the commute can’t be beat — you just have hike up about 150 meters, on the bridge over the creek and up to the distillery building. Talking about the creek, this is an amazing place to live and work. We use water from a spring on the property for our cachaças. Being near the forest, the air is incredibly clean, and of course we don’t ever burn the field or use chemicals. You can smell the bananas, the rainforest flowers, the sea salt from the ocean below. This is what makes our sugarcane so incredible, and the ecosystem that produces it must be protected in order to continue. That’s a pretty damn good incentive to preserve the environment and take care of your people, ain’t it?! In fact, I think that the three tenets of sustainability — (i) protecting your environment, (ii) investing in your community, and (iii) seeking financial results — cannot exist without each other. The field guys have a flock of tiny allies in their field work: the jungle birds. I will let you into a little secret about the jungle: it has a lot of insects. But we seem to always have just the right number of birds to eat the insects, which they do without being prompted. How much cooler than this can it get?! This is another reminder not to screw with nature and upset this balance: we don’t want those birdies leaving us, ever, because we don’t want to use pesticides. In fact, I think that the three tenets of sustainability — (i) protecting your environment, (ii) investing in your community, and (iii) seeking financial results — cannot exist without each other. The team makes good wages, and Brazilian labor laws provide for a month of vacation (paid at 1.3X the regular rate), a 13th month of pay, additional allowances for children and meals, annual raises, and severance pay rights. I think it’s important to note that those who don’t treat their employees well are probably breaking the law, too. Just remember, folks: what goes around, comes around. This seemingly idyllic set-up is not without challenges. Recently we’ve had some problems with the field team. Some of the team members are reporting being annoyed with the fact that Othero is ALWAYS happy. (He says: “Eu estou feliz da vida!”). But after hearing him sing — which he does, often, as an expression of his happiness — we understand the true source of the complaint. Othero, if you are reading this, please ignore the critics and know that your voice is MAGIC. Don’t ever give up that smile! In the end, none of this is very complicated. In Morretes (and anywhere), we care about the human beings around us because it’s good for them, for the community, for the environment, for the cachaça in your glass, and ultimately for business too. It’s called karma and it matters, and I will always strive to offer my team at least as much as they, quietly, offer me. 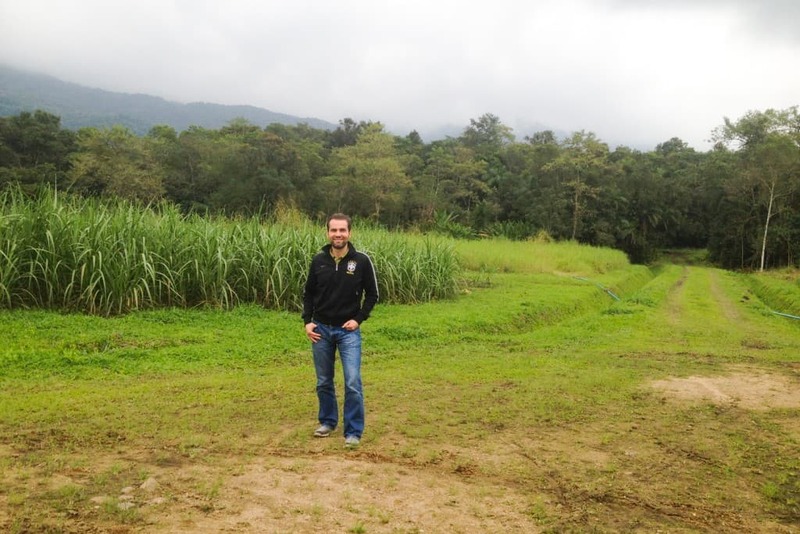 Dragos Axinte and a sugarcane field. 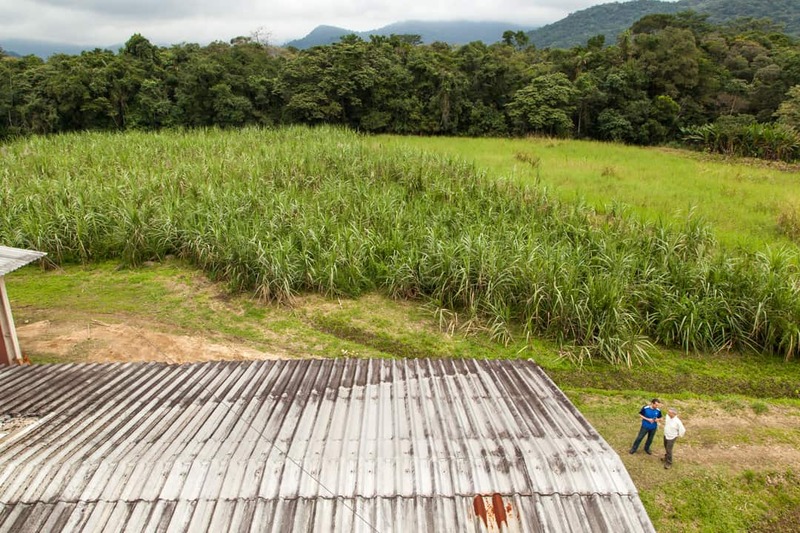 Dragos Axinte chats with Fulgencio Torres Viruel, the founder and Director of the distillery, next to a cane field bordering the rainforest.